Outstanding Crochet: Working on a book proposal. Working on a book proposal. I assume since I don't post pictures from 3rd sources, mane people have left. 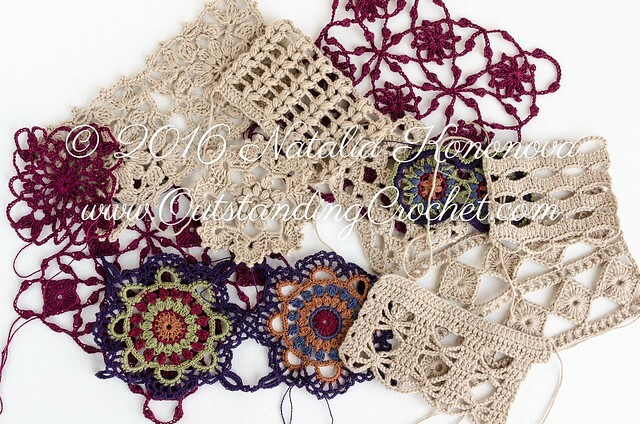 I hope some of you stay loyal and follow me here via e-mail or on Facebook or better Pinterest to see all crochet from around the world there. If not, think about it, all links at the top of the page. All those are swatches for a book proposal I am currently working on, part of them. Today I am hesitating between two different directions. I started to work on this book proposal some time ago. I figured I'd have better chances if my proposal includes 15-20 design ideas with schematics and swatches. Not an easy task to come up with 20 designs at once, hah? Anyway, I am in with about 15 and started to slow down and thinking, " Do I really want to go down this road?" Let's leave alone the fact that there is no guarantee my proposal gets accepted. But! Do I want to give up 20 of my "babies" and sell them once to begin with? Or I can make these patterns and sell them for the rest of my life? Do I want somebody telling me to make changes in my work? Hell, no! Am I going to be ok to work with dead-lines? Probably, yes, but I won't be happy about it. I want to add patterns to my shops no matter what and need time for that as well. Some designers can get a huge help from a publisher if they don't have a good photographer in handy. It's not hard to find one, but it is going to be costly, that's for sure! There will be money up front. Some might not be able to draw charts in vector editing software, so it would be helpful if it can be done for you. There are services out there offering photographing, drawing charts, editing your patterns. But again, it does cost you. If you are an emerging designer, you are not likely to be able to afford it. So thinking all that and knowing I can do all the work from A to Z, do I want to send that proposal? I haven't decided yet. I know many designers choose not to. And I will be thinking and talking to people about that, as I am doing right now! Anyway, it's a lot of fun to work on the proposal because I absolutely love what I am doing. There is not a lot of crochet inspiration or patterns available for real adult clothing. This is why I visit your site everyday and follow your pinterest boards- I like the things you make and seeing what designers inspire you. I love books and I think a book of your patterns would be fantastic. I would purchase it in a heartbeat. A book doesn't require an internet connection or a power supply. However, ETSY and Ravelry are very easy to use and I could always print the pattern out to take anywhere. Whatever you choose to do will be amazing! Thank you! Your comment means so much to me! I am constantly in the "doubting" mood. Should I go down "crochet designing" road, should I not. Should I quit and go test mobile apps... :))); write a book, not to, OMG! Getting feedback is so important! That's what keeps us going... So, thank you again! I think either way you go Natalie, you'll do well! Glad I could help give you input! Thanks for the fantastic 5* review of my book, Colorful Crochet Lace on Amazon! I love the things of your website and if you publish a book, I would buy it! :). Good luck! Love your designs and I would like to think your book will sell well because you have beautiful, unique ideas. In my thinking a book is another step in getting your name known so why not? Being a blogger, even a well known one, and being a published author are two different things, you feel it? You can still sell individual patterns from the book in your store, right? And even if not, those not gonna be your last ones, there will be many more! So if you already have this idea and you can do it why doubting? It's a new important experience so go with it! Go with the book! Thank you, Irina, for the advice! I absolutely love your work! Finish that book..... I am number 1 buying!